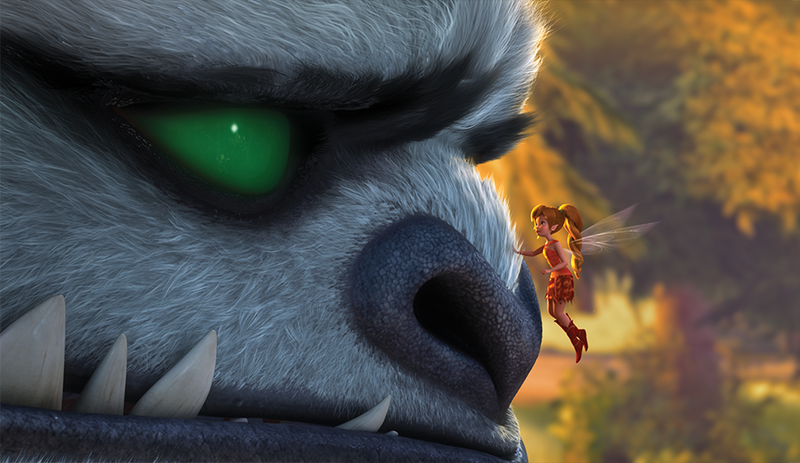 Tinker Bell and the Legend of the NeverBeast (film) Released on Blu-ray on March 3, 2015, after a theatrical release in the U.K. on December 12, 2014, and a run at the El Capitan Theatre in Hollywood beginning January 30, 2015. An ancient myth of a massive creature sparks the curiosity of Tinker Bell and her good friend Fawn, an animal fairy who is not afraid to break the rules to help an animal in need. But this creature is not welcome in Pixie Hollow—and the scout fairies are determined to capture the mysterious beast, who they fear will destroy their home. Fawn must convince her fairy friends to risk everything to rescue the NeverBeast. Voices include Mae Whitman (Tinker Bell), Ginnifer Goodwin (Fawn), Rosario Dawson (Nix), Angelica Huston (Queen Clarion). Produced by DisneyToon Studios.